In 1988 the Dorset County Council showed an interest in commemorating the significance of the radar development work done in the Isle of Purbeck during World War II. They asked Bill Penley (a wartime radar researcher) and Tony Viney (a Worth Matravers Parish councillor) to help them. The county was exploring collection of wartime reminiscences and of placing stone markers with inscriptions on paths at Worth. While these ideas came to nothing, Tony and Bill decided that the significance of the wartime radar work deserved a local, permanent record available to the general public. Bill was already assembling a list of the research workers who were at Worth Matravers in 1942. He wrote to about 200 surviving staff requesting their reminiscences of that time - and also asked at the annual (TRE) radar re-union of wartime staff. Some of the responses have been assembled in the Penley Radar Archives www.penleyradararchives.org.uk. 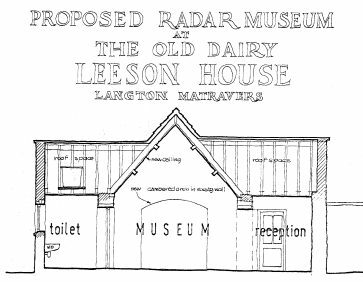 At the same time, David Strange, a farmer at Worth Matravers, offered space for a radar display in a barn conversion he planned for a local history exhibition. Difficulties with planning approval and funding meant that this did not go ahead. However, Bill and Tony decided to look for other possible sites and set up a small group. This was named the Purbeck Radar Museum Trust at an inaugral meeting in February 1991. The Trust became a registered charity in 1993 with general objectives of increasing public awareness of wartime radar development, its importance in World War II and subsequent legacies. In the following years the Trust explored a number of possible locations and collaborations to establish a public exhibition about the early development of radar in Purbeck. These included: the Leeson House dairy buildings, Abbascombe Farm sheds, Durlston Country Park visitor centre and the Top Shop (in conjunction with Langton Historical Society). Eventually a small display was set up in the corner of the Worth Café & Craft Centre - quite close to the original radar research sites at Worth Matravers. In 2005 the Trust received a bequest from Harry Spencer - one of the wartime radar researchers. This enabled a complete re-design of the Worth Café & Craft Centre exhibition, a new brochure and leaflet on early radar development at Worth, publishing this website www.purbeckradar.org.uk, and publication of a new booklet Secret War in Purbeck. When the Worth Café & Craft Centre closed in March 2007, Sq Ldr Mike Dean created a cut down version of the radar exhibition for the Swanage Museum & Heritage Centre. Over the years, members of the Radar Trust have been involved in various activities to raise awareness of the wartime radar work and its significance - see a list of major milestone activities.